4-Day Trek to Machu Picchu. Enjoy the spiritual, but challenging trek to Machu Picchu. Trek must be booked 6 months before trip departure. Depart the morning of day 3 hiking the Inca Trail. This is an incredible yet challenging hike. You need to be prepared and in shape! It is an exceptional hike. Views of snowcapped mountains and high cloud forests are stupendous. Walking from one beautiful ruin to the next is unforgettably mystical. Four days of moderate to strenuous hiking on stone-paved paths with many ups and downs. The highest pass is at an elevation of 13,776 feet. Camp three nights. On the trek, you’ll have a local English-speaking guide and camp staff included. Porters carry all the gear (tents, food, etc.) and cook excellent meals. All you carry is your daypack and sleeping bag, leaving the rest of your belongings in Cuzco. On Day 6, your final approach to Machu Picchu, the “Lost City,” is from above. Standing at the “Gate of the Sun,” the splendid stone ruins of Machu Picchu hover in the mist before you. This is the ultimate reward for mountain trekkers. Limited availability - hike must be booked well in advance. Day 3-5 meals: (B) (L) (D) each day. Day 6 (B). Cost $550 pp. Lake Titicaca. 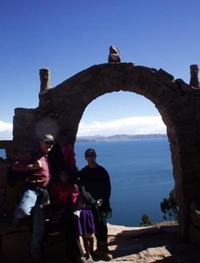 On day 9, fly to Juliaca and transfer to Puno on the shores of Lake Titicaca. Visit the famous Uros Indians and reed villages on Lake Titicaca. Three days/two nights hotel. Day 11 fly to Lima and home. Price per person (based on double occ): $450 (includes flight from Cusco to Juliaca to Lima, two nights hotel, and lake day trip with English speaking guide). Single supplement is $85. Amazon Adventure – Manu National Park. 3 days from $480/pp (4 or more). Lima stopover, pre or post trip. Shop and eat Ceviche in Miraflores. $75 (sgl); $95 (dbl) per night. Cusco stopover, $130 (dbl) or $75 (sgl) per night.